Its simple really, more power = more heat. The 335i is no exception. With the stock car having 300hp/300tq and now with ECU tunes and basic exhaust and intake modification it is not uncommon to obtain over 400hp/400tq!!! However, as some have witnessed (including ourselves) the car's ability to keep itself cool is just minimal. 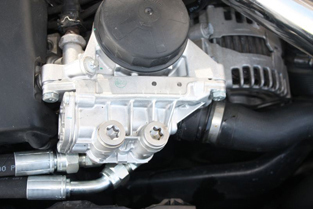 The most common cooling inefficiency is witnessed in the cars oil cooler system (or in some cases, the lack of). The infamous, “limp-mode,” is triggered when the car's oil temps reach to 300F/149C. During a track session, one of our cars with an OEM oil cooler induced a limp mode after just 6 laps. The ambient temperatures were only 79F that day. 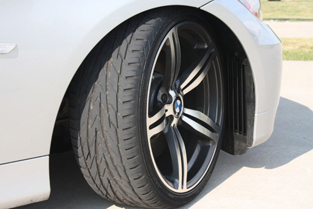 We began to read about similar instances on various BMW forums. Car magazines even witnessed the same high oil temp issues, click here to view a video example. This prompted us to find a solution that would out perform the OEM system and still be affordable. The complete kit: for cars that have no oil cooler. 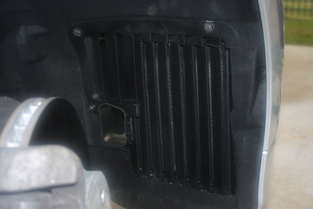 The upgrade: For OEM oil cooler equipped cars. The upgrade kit mounts to your OEM mounting locations. The install takes less then two hours to perform. Don't let the OEM oil cooling system prematurely end your fun. 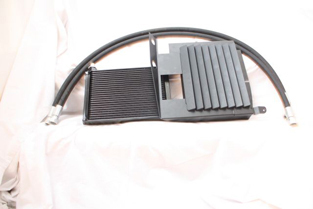 Black powder coated louver with 8 vents for optimal extraction of hot air. For sale for a limited time only $695. "Special Holiday Pricing! In stock and ready to ship"
Note: All sedans and wagons must purchase BMW Fog light in order to fit this kit. BMW Part Number: 63177158542.